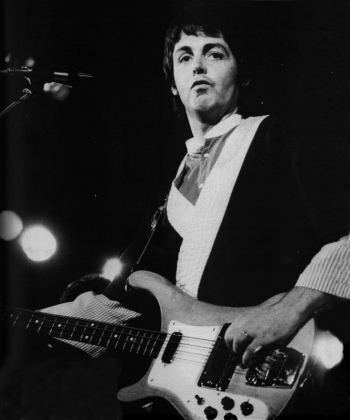 It was the 18th of September, 1975 when I saw Paul after an interval of ten long years. I hadn’t seen Paul since December 1965 at the Glasgow concerts of the last Beatles British tour. I was going out of my mind on the day of the 2nd Wings concert at the Hammersmith Odeon London. The show was a Thursday, and I’d only got the ticket on the Tuesday before. The long story attached to that would make an article on its own, so briefly, tickets were sold out when I applied, so I managed to buy one ticket with only hours to go to Thursday’s concert. The boy who sold me it couldn’t go himself for some reason but looking back he probably agreed to sell it to get rid of me. My neurotic phone call, begging and pleading for the ticket, must have sounded like the ravings of a lunatic. Anyway, I got it, and at the time I didn’t care that it was all the way up in the balcony. I had a ticket, and I’d see Paul after all these years, that’s all that mattered. My husband, Glenn, was driving me up to London and we left about 6pm. The show was to start at 8pm, and despite the fact, Glenn wasn’t familiar with that part of London we thought two hours would be ample time to get me there. Not so. We got lost, and after we’d gone over one particular flyover about three times, we decided to stop and ask directions. I was a bundle of nerves by this time as it was about ten minutes to eight. It turned out we weren’t far from our destination, but by the time Glenn had parked the can, and we’d ran there I’m sure it must have been a few minutes after eight. Anyway, the foyer was practically deserted, so after hastily telling Glenn where I’d meet him later and he said something about being sorry we were late. I dashed right in. I showed my ticket and raced up those stairs about three at a time. I don’t know whether Paul was late or what but the show hadn’t started yet. No sooner had I breathlessly fought my way to my seat and flopped down than the curtain slowly rose to the intro of “Venus and Mars.” The tension of the last few hectic hours got me then and overwhelmed at the sight of Paul after all those years tears came to my eyes. I don’t know why but just then I had a horrible feeling of “Where’s my purse?” I’ve carried Paul’s autograph about since 1963 so for that reason I consciously hold on to it more than if it contained mere money. I realized I didn’t have it, and after looking around, with the help of the person next to me, we still couldn’t find it. So I accepted that it was lost. But I wasn’t going to let even that spoil the show. Even from where I sat Paul looked good. He had on the black pants with a red shirt and black jacket with white lapels and belt. It looked to me like a Kung Fu outfit plus T-shirt but anyway it suited him. I’d been wondering how much Paul had changed, but when he launched into “Rock Show” with that same shake of the hips, I forgot all that. This was the Paul I remembered. Only the style of clothes had changed and of course, gone was the famous Hofner bass. Apart from these differences, Paul was still very much Paul! The running order for the 1975 British tour was different in places from the U.S. and Wembley album so at this point, with Paul at the piano, Jimmy introduced a “rocker,” “Little Woman Love.” Halfway through this transitioned beautifully into “C Moon” then back again. The song didn’t start to Paul’s satisfaction though so after breaking up the song after a few seconds with “Woa, woa, woa. I’m not having it!” All went smoothly at the second attempt. I still don’t know to this day who was in the wrong, but from Paul’s attitude, it obviously wasn’t him. I suppose one of the good things about seeing the show from the balcony was that the lighting and effects looked really good from that distance. The acoustic section was the same as the U.S. part of the tour, and I have to admit I hadn’t heard “Richard Corey” before that night. “I’ve Just Seen a Face” surprised me. Paul said, “This one is skiffly” to introduce it, and he was stomping so hard on the stage throughout I thought for sure his foot would go through the floor! I’d never have guessed he’d include that song in the show but in my opinion, he’s a genius for doing so. “Blackbird” and “Yesterday” were undoubtedly one of the highlights of the night, and I can’t really say anything original about those, it’s all been said before. Paul dedicated “You Gave me the Answer” to Jack Buchanon and when he said, “Anyone remember Jack?” got the response, “What about John Lennon?” (Paul’s answer was ‘what about him?’) By a strange coincidence, I’ve since got to know the girl who shouted that comment, although I didn’t at the time. “Magneto and Titanium Man” followed, then Denny’s “Go Now.” At this point, as Linda joined Paul at the mic, I realized she was actually there. She was wearing a black multi-colored dress for anyone who wants to know those sort of details. Paul went back to the piano again for “Call Me Back Again.” I’d been waiting for him to sing this so I thoroughly enjoyed it. I swear he’s so much better live and I feel really sorry for anyone who hadn’t been lucky enough to see Paul in concert yet. “My Love” followed with barely a few seconds between them. Then “Listen to What the Man Said.” Paul introduced the brass section next before singing “Letting Go.” Even from my distant seat, the way Paul moved to that one was magic. This was another song I thought came over much better live than on record. “Junior’s Farm” and “Medicine Jar” brought us to the last song, “Band on the Run” and the welcome surprise of the film of the lp cover. It didn’t seem possible that two hours had already passed and I felt so sad then. Not having seen the show before I didn’t know for sure if Paul always did an encore so I couldn’t have been happier when they reappeared for “Hi Hi Hi.” After that I was sure that the concert had ended but after they again came back for “Soily.” I couldn’t believe my luck! No one moved to leave even after that last encore and the whole hall echoed in “We shall not be moved.” The group did come out again to throw flowers into the audience and Paul briefly “conducted” the singing before explaining they had no more songs. Everyone reluctantly started to leave then. Personally, I was willing to wait all night just in case Paul changed his mind, but I remember my poor husband on this chilly September evening outside. As I was leaving my seat to walk downstairs someone rushed up to me holding my purse, asking if it was mine and I couldn’t believe it! What luck as it’s not often that people are as honest as that. Apparently, I’d dropped it on my way to the seat after all. That really made the evening perfect. I didn’t have many pounds in my purse, but I’d have hated to have lost that autograph.